Chimichurri. It’s a funny word but a seriously delicious sauce. 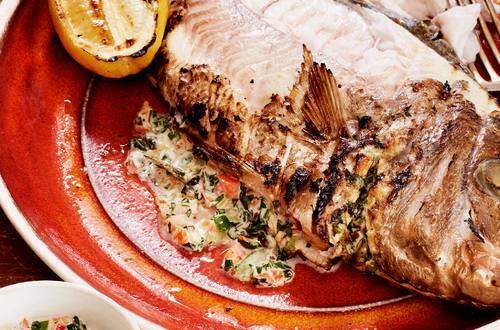 Try it with smoky, grilled fish for a little taste of South American heaven. 1 Prepare a BBQ with one side filled with hot coals. Making sure the grill is very clean and well oiled. 2 Dry off the fish and rub with salt and oil, set aside. 3 In a separate bowl, mix Hellmann's® Real Mayonnaise together with chipotle pepper, garlic, coriander, parsley, red pepper, green pepper and spring onion. Then stuff the cavity of the two fish with the mix. 4 Place on the bbq (use fish cage if you have one) cook for 10-15 minutes (depending on the thickness) or until flesh is opaque and cooked. 5 Remove fish from BBQ (and fish cage if you are using one). Remove skin and place onto large plate. Finish with lemon juice and serve with stuffing.